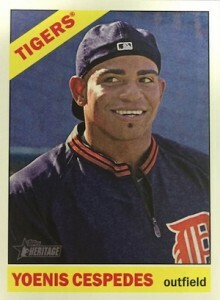 2015 Topps Heritage Baseball isn't about surprises. It's unapologetic in its nostalgic, heading back to 1966 for its inspiration. Traditionally popular with set collectors and those with fond memories of the past, it's highlighted by a challenging but not impossible base set and plenty of inserts. While not the major focal point for many, hobby boxes do come with the promise of an autograph or memorabilia card. 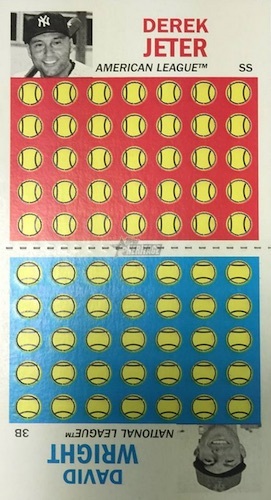 Falling in line with the brand's lineage, the 2015 Topps Heritage Baseball base set uses 1966 Topps Baseball as its foundation. The main part of the set has 425 veterans, rookies and managers. The checklist is finished off with 75 short prints. Variations return with several themes. Action Image Variations are exclusive to hobby packs. These switch out the traditional portraits found in the set for action shots. Throwback Uniform Variations show players in old-school uniforms. Collectors can also find Throwback, Error and new Traded Player variations. 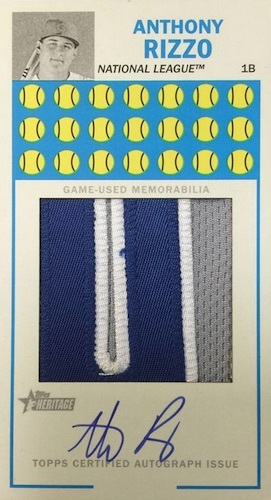 In a small switch from the previous couple of years, Black (or Venezuelan) backs have been replaced by Blue Back parallels. The always popular Chrome cards return. These come with Refractor, Black Refractor (#/66) Gold Refractor (#/5) parallels. For those who have collected Heritage in the past, there's nothing new in the basic insert departments. Returning for another year are New Age Performers, Baseball Flashbacks, News Highlights and Then and Now, which pair 1966 league leaders with their 2014 counterparts. Similarly, there aren't a lot of surprises in the hits department. All autographs have on-card signatures. Leading the way are Real One Autographs, which highlight active players and retired players who might not see a lot of cardboard ink. Red Ink versions are numbered to 66. Collectors can also find Dual Autographs (#/25) and Triple Autographs (#/5), but only in hobby packs. 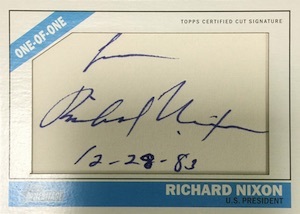 Among the other autographs in 2015 Topps Heritage Baseball are Flashback Autographed Relics and one-of-oneCut Signatures. Clubhouse Collection is the foundations for the product's memorabilia cards. These use uniform swatches and bat pieces from active players. Dual Relics (#/66) return and are joined by new Triple Relics (#/25) and Quad Relics (#/10). Clubhouse Collection Autographed Relics (#/25) and Dual Autographed Relics (#/10) are also randomly inserted. 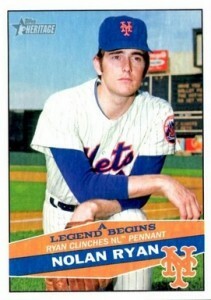 '66 Mint cards feature players from 1966. These have a coin minted from that year embedded in them. 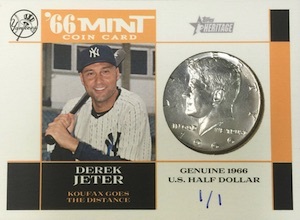 Tiers include Nickel (#/15), Dime (#/10), Quarter (#/5) and JFK Silver Half Dollar (1/1). 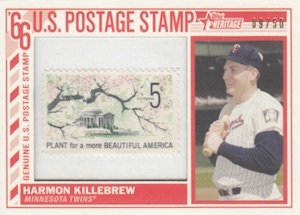 Similar in theme are Postage Stamp Relics (#/50) that have a picture of a player or event from 1966 that is joined by an American stamp from the same year. Adding to the nostalgia are four sets of Stamped Buybacks: 1966 Topps Rub-Offs, 1966 Topps Batman Black Bat, 1966 Topps Get Smart and 1966 Topps Lost in Space. These are original cards that have a special 50th anniversary stamp added to them noting they're from this release. Keeping with the trend of adding a box loader to every hobby box, there are three themes in 2015 Topps Heritage Baseball. Returning are the three-card strip Ad Panels and Stamped Buybacks. 1966 Oversized Punchboards (#/50) are an homage to the similarly styled game from five decades earlier. In addition to the limited edition basic versions, there are Jumbo Patch (#/25), Autograph (#/10) and Autographed Jumbo Patch (#/10) parallels. CHRIS ARCHER 2015 TOPPS HERITAGE GW JERSEY RELIC! BLUE JERSEY! 75 cards. Inserted 1:3 hobby packs. 20 cards. Inserted 1:3,310 hobby packs. Click here for full variation details. 25 cards. Inserted 1:24 hobby packs. Hobby only. Click here for full variation details. 25 cards. Inserted 1:140 hobby packs. Click here for full variation details. Inserted 1:840 hobby packs. Click here for full variation details. Inserted 1:2,310 hobby packs. Click here for full variation details. 100 cards. Serial numbered #/999. Inserted 1:23 hobby packs. 100 cards. Inserted 1:231 hobby packs. Serial numbered #/100. 20 cards. Inserted 1:110,000 hobby packs. 20 cards. Inserted 1:2,310 hobby packs. 15 cards. Exclusive to Target. 15 cards. Exclusive to Walmart. 10 cards. Inserted 1:12 hobby packs. 41 cards. Inserted 1:31 hobby packs. 5 cards. Inserted 1:6,950 hobby packs. 5 cards. Inserted 1:18,688 hobby packs. Hand Numbered #/10. Inserted 1:46,720 hobby packs. 7 cards. Inserted 1:9,100 hobby packs. 2 cards. Inserted 1:17,515 hobby packs. Hand Numbered #/10. Hobby only. 2 cards. Inserted 1:18,688 hobby packs. 20 cards. Inserted 1:8 hobby packs. 48 cards. Inserted 1:258 hobby packs. 7 cards. Inserted 1:3,515 hobby packs. Serial Numbered #/25. Hobby only. 5 cards. Inserted 1:35,000 hobby packs. Serial Numbered #/5. Hobby only. 10 cards. Inserted 1:10 hobby packs. Serial Numbered #/50. Hobby Only. 17 cards. Serial numbered #/20. Good: Challenging but attainable base set, on-card autographs, interesting retail inserts. Bad: Not much for those chasing autographs and memorabilia, five variation styles is too much, portrait photos in base set are — for the most part — bland. The Bottom Line: As the Heritage line continues its journey through the 1960s, it’s much the same as it has been for years. The focus is, appropriately, on the base set with just enough on the periphery to keep things a little more interesting. Autographs and relics remain a low priority, which may be a turnoff to some. Heritage works best when it’s nodding directly to the set and timeframe it’s drawing from, which in this case is 1966. Like every Heritage set before it, 2015 Topps Heritage Baseball takes the theme of a past year and runs with it. This time around, it’s 1966 — a clean but not overly memorable set. And that carries over to today. It looks nice, but there’s nothing in the base set that seems overly memorable. While the dedication to recreating elements of the inspiration set is one of the things I appreciate most about Heritage, it can also be one of the biggest hinderances. Here, it’s the photography in the base set. Shots are either posed portraits or quaint shots that are zoomed in tight and might as well be posed portraits. I like these in small doses but spread over 500 cards and it gets tiresome. Inserts are a mixed bag. Autographs use their simplicity and on-card signatures to be strong. Relics come with decent portions. The News Flashbacks are a favorite, capturing the look and feel of the era with some great moments and photos. The retail-exclusive sets dedicated to Nolan Ryan (A Legend Begins) and Sandy Koufax (A Legend Retires) are also standouts if you look at the product as a whole. On the other end of things are the boring New Age Performers, and Then and Now. Both are blah at best, especially as inserts. 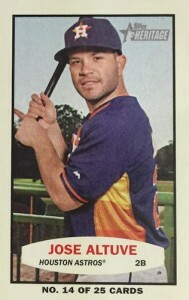 There’s a lot going on 2015 Topps Heritage Baseball. As with tradition, the base set is tricky but manageable. To that end, it’s similar to Upper Deck Hockey where there’s a dedicated core who go after the main set and its short prints. I’m left scratching my head once again as to who some of the autograph signers are. But that’s because I wasn’t alive in 1966 when a lot of the more obscure players were active. At the same time, I never think too much about autographs since they’re such a small part when you’re busting by anything but the case. The Topps variation train continues to roll with five different types. I like the idea of the error hat tips that recreate original mistakes. The throwbacks also seem appropriate. But other than that, there are way too many. Would the product be much different without the Color Swaps? I doubt it. This is one area where things can definitely be tightened. Value is going to depend on what you are looking for in Heritage. If you’re working on building a set or delving deep, the price isn’t too high and there’s lots to go through. However, if you’re looking for at flipping what you get, it’s going to take a lot of time and effort. The deep checklist helps, but it’s a lot of smaller things rather than landing big cards on a consistent basis. If you’re on the fence, ask yourself what you’re hoping for an give the checklist a close look. That way there are no bad surprises and less chance of being disappointed. I’ll freely admit that Heritage isn’t a go-to brand for me. In many ways it should be as it touches on a lot of the things I usually like in a product. But the nostalgia doesn’t do much for me. That will change if it’s still around in 15 years or so, but I have no memories of opening packs of 1966. It was before my time. So without that connection, I feel disconnected and often bored. I wouldn’t say that 2015 Topps Heritage is that much different for me, but there was enough in there to keep my interest through one box. Even the Gum Stain Backs, which I was initially hesitant about, were something a little different. I wish the approach was different, but both me and my son immediately went to scratching and sniffing when we found one. That’s the fun of collecting — something I wish there was more of. But with a brand that’s stuck in the past — even intentionally — it’s hard to break new ground and capture the attention of those that didn’t experience it the first time around. The design of this base set brings back fond memories of my card collecting days’ of Topps baseball cards in the mid 60s’. I wish I still had all the the old ones from that time. 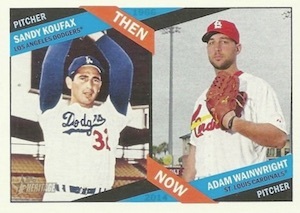 These Topps Heritage cards have great look and feel of that era…love it!!! Any ideas when the checklist will come out for these and the others? John � Checklists usually don’t come out until right around when the sets come out. It is less then 4 weeks till the release date and in Topps perfect form they do not have a complete checklist of the cards that will be in this set. At least with other card companies they at least have this information out there for people to decide if they want this product. Edward � Checklists from EVERY company aren’t normally released until about a week before a set comes out. At best, a couple of weeks in advance but that seems to be the exception these days. Just a head’s up, but the the “best price” of $36.99 for a hobby box listed above is very misleading. The eBay listing (that is linked to that price) is for a half box (12 packs). I assume the “best price” feature is a formula or algorithm and this listing snuck through the cracks. The saying “if it’s too good to be true, then it probably is” obviously applies here, but I’m sure there will be some people who place an order without reading everything. Thanks for the write up. Jonathan � Thanks for the heads up! We do our best to keep up on these. It should be filtered out now. the way baseball cards should be made today. also, always tremendous value. i open several cases every year. Ok we are 10 days out from release. I’ve been waiting for this to come out all winter. You’ve posted about the checklist. I think it was me that asked. So….Any ideas when the checklist will be out? John � It will be posted as soon as it’s available. When that is exactly isn’t in our hands. As mentioned before, they usually come out right before the release. I suspect it will be this week but we won’t know until we get it. Looks cool. Am I missing short prints? Oh nevermind. I see them. Looking forward to this set, but disappointed that Clemente is lacking. He DID win MVP in ’66. 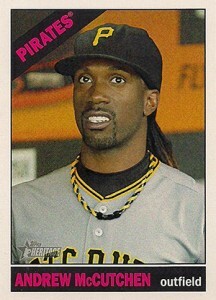 I agree Don, I was looking forward to a Clemente. Also some trade variations and the missing Warren Spahn #115 that was on the checklist. Maybe they’ll be SSP? Any information on the Color Swap set? Wow. Arod sits out all year and gets card but no Jeter in his final year? Also, no Jim Palmer auto? This was his rookie year. I should just stop buying these. Hobby box yielded a Gattis jersey card and a Scherzer chrome /999. Lucky it was Scherzer I guess. Yu Darvish Throwback uniform variation!!! Just noticed an error. Trevor Rosenthal picture on Lance Lynns card (#62) of the set. After seeing so many awful hobby box breaks where the only hit was a .99 cent jersey card, I decided to buy a few retail packs. Once again, Topps retail is the way to go. – Matt Kemp Clubhouse Collections Gold Relic /99. One box every pack had a purple chrome card and the other box NONE… ??? Charles � I believe the first box you opened is a hot box that comes with several of the Purple Refractors and that’s the only way to get them. At one time Heritage was a 5 star product. What happened ? They no longer mimic the original cards. 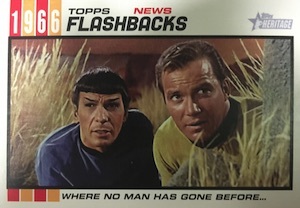 What happened to the team cards,that are not team picture cards as in the original set but some excuse Topps has come up with calling them team cards. There were never multiple variations of cards like these. there are at least 8 different types of variations.This set is starting to look like something to make money on E-bay. News Flash- unless you get one of the really rear cards you will go broke. I have seen friends spend a lot of money trying to get rich and failing. 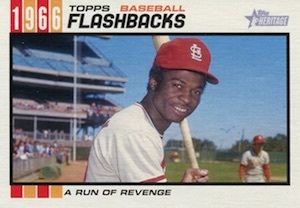 I wish Topps would go back to the basics, put out a fun set to build and get rid of all the stupid gimmick cards. They are just not worth it. Question. Why does card #184 Grandal show Padres on the front and on the back L.A. Dogers? 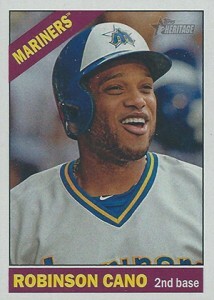 Did Topps get so rapped up in trying to make hundreds of variations that they missed one? I for one would not be surprised. The code is 53 for a common. You’d have to ask Topps. Probably just a mistake. Heritage does not resonate with me as it does with other collectors, probably because I’m too young, but I like the throwback. I won’t get too much of Heritage but I do enjoy it. 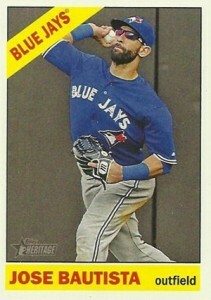 I like the variations seen in Heritage better than in other Topps products but they’re towing a fine line. Chrome has to go though. Just out of place in a nostalgic product. Overall, good set. Autos and relics are not the point in this set, I wish other collectors would realize this. 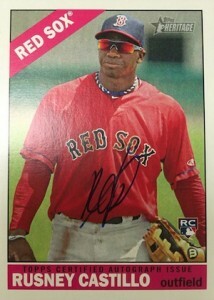 The autograph I received was a scrub, $5.88 sale price on eBay. But Topps really loaded the Hobby Cases this year. With top loaders that had autographed and patch versions of the punchboard cards. This year has been much better than in previous years as far as value for the price. I was getting so tired of paying $650 for a hobby case, only to get $200 in return. 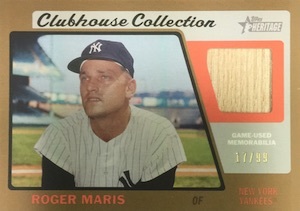 This year I finally got a marque dual bat card with Jeter and Maris on it, and finally one of the highly coveted, ultra rare, throw back uniform cards seeded at 1 in 3,310 packs. Or 1 in more than 10 cases. Purchased two hobby boxes and my second box I ripped had no autograph or relic. Also to many cards are not centered. Very disappointed with the Heritage product this year. I got a question, I opened a hobby box and every last card in pack was a purple chrome. So I got 24 purple chrome cards, is this a special box or what? I’m confused. Mitch � Nice box! It is a Purple Chrome hot box, which delivers a Purple parallel in each pack. This is one of the most boring boxes I have ever opened. And I had one of the “hot boxes”. There is absolutely nothing special about this product. I really must say that I am very disappointed in the fact that Topps didn’t include reprints of the original 1966 Punchouts in this set. The originals are so extremely rare that most collectors will never even get the chance to ever see one in person. It’s not like it would’ve cost that much to reproduce the original 14 cards! People! People! Know your product. This is not a high end product. I have opened 7 boxes and am overall impressed. I went ino it knowing this was not a “pull per pack” product and have been able to put together a Master Set and have numerous variations. 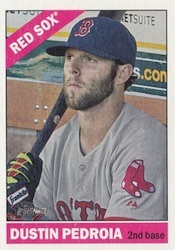 It is an affordable, mid-range Topps product. The problem I have with this set and past Heritage sets, is the quality of the photos used. Looking at my original ’65/’66 cards – the photos for the most part are crisp and sharp. I think this will be my last year collecting these cards. Love these cards. I am very new to collecting. I pulled a LA Dodger Brandon McCarthy card and he’s wearing a throwback jersey. I noticed he is the only card of over 500 that is wearing a throwback. How would I go about finding out exactly what I have and if it’s worth anything? Just opened a hobby box and no auto or relic. What gives? What next? Shane � Contact Topps and make sure you don’t throw out the box or your receipt as they may require it. this is a fun set to collect. 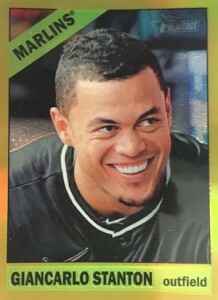 some players……lester, gordon, cespedes off the top of my head, have cards with them on their past teams as well as present..ie; i have a card with lester on A’s and one on Cubs….do u know how many players have this…is there a list somewhere? Just opened 18 packs. Nothing but 1-425 basecards!!!! Unbelievable??!!? Love collecting Heritage but the original ’66 set was not one I particularly enjoyed. Next years should be epic with the ’67 design. I have only bought one blaster from Target but pulled a blue back Kershaw that I am darn pleased with considering I only had odds of 1:462 for a blue and I received a legend. I like this years heritage from 1966, very good product for its price. However, I don’t like the whiteout markings on the backs on some the cards, I think it cheapens the product. Hopefully this will be the last year they do it. I mean if you do a product do it right. 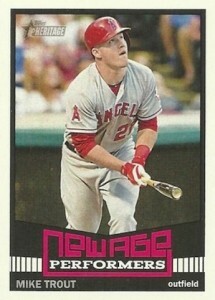 Looking forward to series 2 lets not have topps update cards mixed in like they did about 3 years ago.